My friend Jen came over for a sticky bun bake off. 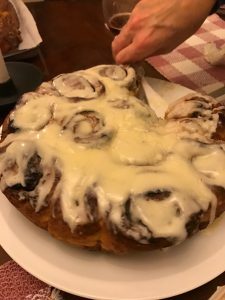 I went for a sourdough, pecan sticky bun and Jen prepared a sourdough cinnamon bun with cream cheese and butter frosting. Baking these pastries involved two conflicting dramas for me. 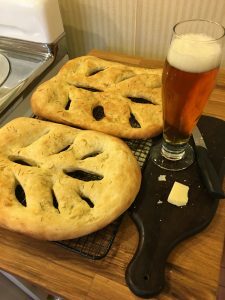 On the one hand, it meant I had to carefully follow a recipe, not one of my cooking attributes. 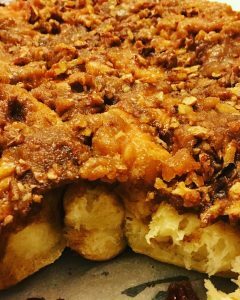 On the other, I love pecan sticky buns, and ever since having eaten a sourdough sticky bun at Arizmendi Bakery in San Francisco that changed my life, I knew I had to give it a try. 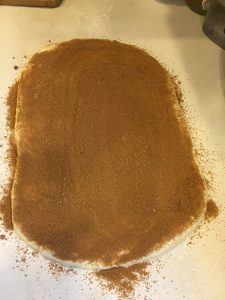 Once the dough had risen, I rolled it flat, painted its surface with melted butter, and covered it in brown sugar and cinnamon. I rolled the dough into a tube, sliced the tube into small cylinders and laid each one on a bed of chopped pecans. Here they are in the pan, but you are looking at the bottom. They have to be flipped and then they look like THIS. The funny thing is because I followed the recipe and cooked the buns for precisely twenty-two minutes at 400 degrees, they came out undercooked in the middle. The dough was still a little creamy. 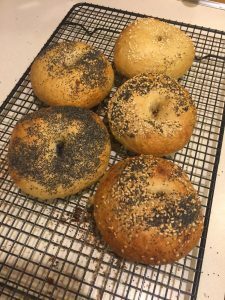 Next time I bake at 325 degrees (like a challah) for forty-five minutes and leave space between the buns so the outer crust of each one gets crisp. 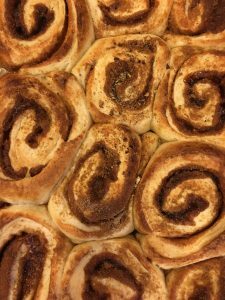 Here is what Jen’s cinnamon buns looked like. Pure awesomeness. It was an excellent dessert to follow on a vegetable-infused pasta smothered in a tomato sauce that Isaac prepared with seared disks of homemade sausage, halved brussel sprouts roasted in the sausage fat, and red wine. He reduced the sauce until it was thick as a cassoulet and dark as burgundy. and some bagels he helped prepare.